The Dutch Parelsnoer Institute-Cerebrovascular accident (CVA) Study is part of the Parelsnoer Institute (PSI), initiated in 2007 by the Netherlands Federation of University Medical Centers (NFU). PSI is a cooperation of all eight Dutch University Medical Centers (UMCs) and aims at building large prospectively collected datasets with uniformly and standardized storage of biomaterials for complex diseases. Currently, PSI covers 18 disease-specific cohorts called ‘Pearls’, and this number is still growing. One of these cohorts is the Stroke or CVA Pearl. For each of the cohorts, PSI offers the UMCs an infrastructure and standard procedures for storing the specific biomaterials in their certified biobanks. Clinical data are stored in a central database after being pseudonymized to ensure patient privacy. For the Parelsnoer Institute-CVA Study, blood for genetic analysis, serum and plasma are collected according to nationally agreed standards. Currently (November 2017) the Stroke Pearl has stored blood samples with prospectively obtained clinical data of around 6000 patients in all UMCs combined. Blood samples and data are available for all researchers with a methodologically valid research proposal. Funding statement: PSI was founded in 2007 with a five year grant from the Dutch Government. From 2011 until now PSI is funded and facilitated by the Netherlands Federation of University Medical Centers (NFU) and its member institutions, independent of external funds. Additional funds from governmental sources, industry sponsors and charity are used for the analysis on the existing data and the expansion of PSI with new diseases. The Dutch Parelsnoer Institute-Cerebrovascular accident (CVA) Study is part of the Parelsnoer Institute (PSI), initiated in 2007 by the Netherlands Federation of University Medical Centers (NFU) . PSI is a cooperation of all eight Dutch University Medical Centers (UMCs) and aims at building large prospectively collected datasets with uniform and standardized storage of biomaterials for complex diseases. Currently, PSI covers 18 disease-specific cohorts called ‘Pearls’, and this number is still growing [2, 3, 4, 5, 6, 7, 8, 9, 10, 11, 12, 13, 14, 15, 16, 17, 18]. PSI is centrally organized and has an executive board for operational management to ensure collective standardization strategies. Additionally, a team of PSI experts supports researchers and the executive boards of the participating UMCs with implementing these strategies. Standardization between and within UMCs is established via multiple standard operating procedures (SOPs) regarding i) storing of biobank materials in the certified biobanks of the UMCs. These SOPs are developed by biobank coordinators from all UMCs together and cover all phases of biobanking. ii) managing the clinical database for every specific disease, hosted via a web based application (ProMISe) [1, 19] (Figure 1). 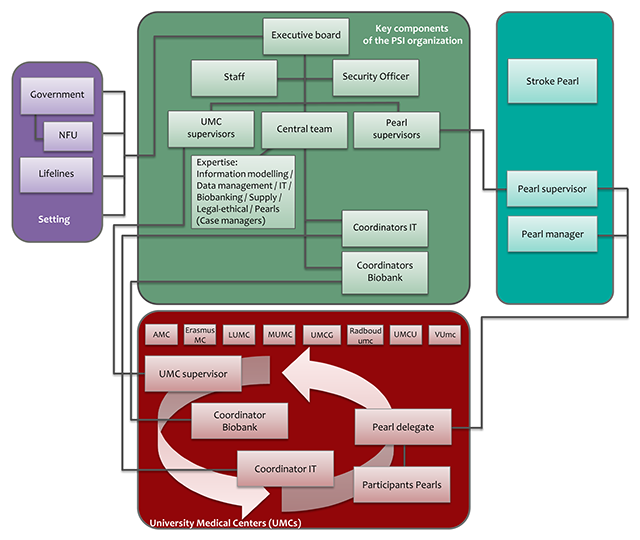 Organogram of the Parelsnoer Institute. For the Dutch Parelsnoer Institute-CVA Study, each UMC stores blood for genetic analysis, serum, and plasma in their own certified biobank. The creation of large stroke cohorts is currently of great importance in genetic stroke research, illustrated by genome-wide association studies (GWASs) performed in the last years [20, 21, 22, 23]. Stroke is a heterogeneous disease consisting of several etiological subtypes with different underlying pathophysiological mechanisms. These subtypes include ischemic stroke and transient ischemic attack (TIA), cerebral venous sinus thrombosis, intracerebral hemorrhage and subarachnoid hemorrhage. Ischemic stroke mainly consists of the subtypes large vessel atherosclerosis, cardio-embolism and small vessel disease. Large etiological subtypes of intracerebral hemorrhage are small vessel disease and vascular malformations. Aneurysmal subarachnoid hemorrhage can be classified as aneurysmal or perimesencephalic. Most subtypes are thought to have a specific genetic architecture, as GWASs have found multiple genetic loci to be subtype-specific. Future genetic stroke research may lead to management approaches more tailored to the different subtypes and novel therapeutical targets [20, 21, 24]. The aim of the Dutch Parelsnoer Institute-CVA Study is first to create a large prospective cohort of stroke patients with blood samples and DNA collected through standardized procedures and stored in an uniform way. These samples are coupled with stroke subtypes according to the TOAST classification and the ASCO system. The Trial of Org 10172 Acute Stroke Treatment (TOAST) classification distinguishes i) large-artery atherosclerosis, ii) cardio-embolism, iii) small vessel occlusion, iv) stroke of other determined etiology and v) stroke of undetermined etiology as etiological stroke subtypes . The ASCO system (where A stands for atherosclerosis, S for small vessel disease, C for Cardiac source, O for other cause) classifies similar subtypes, though both classification schemes have been found to have different characteristics in practice [26, 27]. These classifications enable us to investigate associations between genetic risk loci and stroke subtypes and to enable pooling with data of other ongoing genetic stroke studies [20, 21, 25, 27]. Second, besides genetic research the Parelsnoer Institute-CVA Study population is also very well suited for epidemiological studies because of its prospective, multicenter design and large sample size . All eight Dutch University Medical Centers: Academic Medical Center (Amsterdam), Erasmus Medical Center (Rotterdam), Leiden University Medical Center, Maastricht University Medical Center, Radboud University Medical Center (Nijmegen), University Medical Center Groningen, University Medical Center Utrecht, VU University Medical Center (Amsterdam). For the Parelsnoer Institute-CVA Study, the UMCU started collecting data in 2009, the seven other UMCs started in 2010. Data collection is ongoing in five UMCs, no end date has been determined. The blood samples are available for researchers with a methodological valid research proposal (see access criteria for more information); no end date has been determined. Inclusion criteria for the Dutch Parelsnoer Institute-CVA Study are a diagnosis of TIA or stroke, presenting in one of the eight Dutch UMCs within one month after stroke onset. Stroke encompasses ischemic stroke, cerebral venous sinus thrombosis, intracerebral hemorrhage, and subarachnoid hemorrhage (both aneurysmal and perimesencephalic hemorrhage). Further inclusion criteria are age >18 years and the provision of informed consent. Informed consent is defined as written consent by the donors to collect data and biological samples in a Biobank for future scientific purposes in order to study etiopathogenesis and the clinical course of CVA. Informed consent includes the option for the donors to revoke their consent any time, after which the data and biomaterials will be removed from the CVA Biobank, except for the data and samples already included in research protocols. These very broad inclusion criteria result in the incorporation of nearly all stroke patients seen in Dutch UMCs in the Dutch Parelsnoer Institute-CVA Study database. For every patient, data on medical history, family history, vascular risk factors, medication use and exact time of stroke symptom onset are recorded. Deficits in neurological examination at baseline are recorded according to the National Institutes of Health Stroke Scale (NIHSS), a graded assessment of consciousness, eye movements, visual fields, motor and sensory impairments, ataxia, speech, cognition and inattention . Ischemic stroke subtype is defined according to both the TOAST classification and the ASCO system [26, 27]. Data are collected on treatment such as intravenous thrombolysis, neurosurgical (clipping or decompressive surgery) or endovascular (coiling of aneurysms, intraarterial thrombectomy or thrombolysis) intervention, start of oral anticoagulation treatment in case of atrial fibrillation, and start of secondary prophylactic treatment. Additionally, we collect data on laboratory investigations and on imaging, i.e. brain CT and CT angiography, brain MRI and MR angiography and ultrasound investigations. After three months functional outcome is prospectively recorded via a structured telephone interview, using the modified Rankin Scale . For the Parelsnoer Institute-CVA Study, a specific Parelsnoer Repository for Information Specification, Modelling and Architecture (PRISMA) has been defined. PRISMA is an information model enabling us to reuse electronic health record (EHR) information for scientific purposes. This reuse of information minimizes registration burden while at the same time routine care procedures are taken into account. The architecture is in agreement with national and international classifications such as International Classification of Diseases and Related Health Problems (ICD-10), SNOMED CT and the Logical Observation Identifiers Names and Codes (LOINC®) . For all stroke patients included in the Parelsnoer Institute-CVA Study, all predefined demographic and clinical variables including data on functional outcome are recorded as coded data via PRISMA and are sent to the central PSI database, a validated web based application (ProMISe) . Additionally, blood for genetic analyses, serum and plasma are collected, preferably during routine clinical procedures. Blood samples are then stored in certified UMC biobanking facilities adhering to the PSI biobanking protocol. This protocol covers all phases of biobanking, from collection to storage of the samples. Metadata on blood samples and the unique sample code are registered in the central database together with the clinical data. Table 1 gives a summary of procedures on collection, processing and storage of samples defined in the biobanking protocol of PSI. Summary of procedures on collection, processing and storage of samples defined in the biobanking protocol of PSI. * See the ‘Quality assurance measures’ section for detailed additional information. PSI uses two main strategies to guarantee uniform collection and storage of clinical data between UMCs which are i) limiting the number of collected variables to only the essentials and ii) using existing EHR infrastructure within UMCs infrastructure for recording of data. As there is no possibility to improve quality of biomaterials afterwards, strict adherence to biobank related SOPs optimizing integrity of biomaterials is needed. Biobank coordinators from all UMCs have together developed the PSI biobanking protocol, encompassing all phases of biobanking, i.e. sample collection, pre-analysis, registration, processing and storage. The biobanking protocol according to Biospecimen Reporting for Improved Study Quality (BRISQ) is as follows . Blood collection for the CVA Biobank is performed according to the biobank SOP. EDTA blood (10 ml) and Serum blood (10 ml) are collected by venipuncture in the arm. Collection of smaller tubes and pooling of samples is not allowed. Clotting time for serum is defined at 60 minutes at room temperature. Blood is to be stored at room temperature until centrifugation. Centrifugation is to be performed at 2000 g either at room temperature or at 4°C. Aliquoting is in volumes of 0.5 ml in at least 5 quantities. Processing time from venipuncture to storage in freezer at –80°C is predefined at preferably 2 hours with a maximum of 4 hours. All samples are stored under unique identifiers without identifiable patient information. DNA samples from EDTA blood are to be processed within 4 weeks when stored at 4°C or within 3 months when stored at ≤–20°C. Processed DNA should be stored as at least 2 stock solution aliquots at ≤4°C with unique samples codes, including concentration and quality data based on the OD 260/280 ratio. All processing and quality data, including specific time points to assess processing time and track and trace of the samples are registered in a local Biobank Management Information System. Core samples data are provided to the central infrastructure of the Parelsnoer Institute CVA Biobank. In addition to the processing data deviations from the Biobank SOP per individual sample, if applicable, are also registered in the database. These SOP deviations include: hemolytic, lipemic, icteric, wrong blood tube, incomplete filling of the blood tube, temperature deviation, processing time deviation, mixing problems, centrifugation deviation, storage problems and free text remarks (Table 1). Data are recorded from electronic health records and laboratory reports. Each UMC has its own research IT infrastructure that delivers the data to their local database in ProMISe, a web based application. The information supplied by each UMC is first validated and then periodically uploaded to the central Parelsnoer Institute-CVA Study database in ProMISe for storage on a national level. During uploading, identifying patient data are encrypted using special software of a trusted third party (Trusted Reversible Encryption Service®, Houten, Utrecht, The Netherlands). As additional measure for protection of privacy, the identifying data are encrypted again when exported from the central database for research purposes. In specific situations, e.g. in case of incidental findings that need feedback to the patient or in case of data-linkage, de-pseudonymization can be performed by authorized personnel. The PSI IT infrastructure is in agreement with privacy and international security standards . The Parelsnoer Institute-CVA Study Group uses a patient information brochure, regulations and a consent form, approved by the local Medical Ethical Committees (MECs) of all UMCs. Subsequently, both MECs and Board of Directors of the remaining participating UMCs approved local implementation of the biobanking activities . The study is performed according to the principles of the Declaration of Helsinki and in accordance with the Medical Research Involving Human Subjects Act and codes on ‘good use’ of clinical data and biological samples as developed by the Dutch Federation of Medical Scientific Societies [32, 33]. All patients should give written informed consent prior to inclusion. Only patients who have provided written informed consent are included. The PSI does not include healthy controls. After inclusion, patients may withdraw their consent at any time. The patient can express the wish to withdraw to his/her doctor, in which case the doctor will ensure that data and materials are destroyed unless needed for validation of earlier issuance. The Dutch Parelsnoer Institute-CVA Study is a disease based cohort with longitudinal collections, sampled in clinical care. The brain and cerebral vasculature, including cervical vessels. For the Dutch Parelsnoer Institute-CVA Study, a full clinical characterization, including extensive diagnostics, demographics, therapeutics and clinical follow-up is specified. Ischemic stroke and transient ischemic attack (TIA), cerebral venous sinus thrombosis, intracerebral hemorrhage, and subarachnoid hemorrhage (both aneurysmal and perimesencephalic hemorrhage). The Parelsnoer Institute does not collect control samples from healthy individuals. For the Dutch Parelsnoer Institute-CVA Study blood samples for genetic analysis, serum and plasma are collected and stored. Table 1 gives a summary of procedures on collection, processing and storage of samples defined in the biobanking protocol of PSI. As of November 3rd 2017, clinical data of 6074 and blood samples of 5769 patients were available in the Dutch Parelsnoer Institute-CVA Study. Of all patients with clinical data, 4390 had a final diagnosis of ischemic stroke (72%), 786 of subarachnoid hemorrhage (13%), 599 of intracerebral hemorrhage (10%), 114 of cerebral venous sinus thrombosis (2%). Further, 48 patients (1%) had another final stroke diagnosis and of 137 patients (2%) final diagnosis was missing. PSI has no end date. Data and samples of the Dutch Parelsnoer Institute-CVA Study are currently available. Regarding all disease cohorts, the research projects based on PSI data and samples have led to several scientific publications [2, 3, 4, 5, 6, 7, 8, 9, 10, 11, 12, 13, 14, 15, 16, 18]. PSI has an online open access catalogue with up-to-date information about the content of the Dutch Parelsnoer Institute-CVA Study, providing insight for researchers worldwide and offering them the opportunity to submit a research proposal to the Dutch Parelsnoer Institute-CVA Study and request its data and blood samples . These proposals are reviewed by the scientific committee of the Dutch Parelsnoer Institute-CVA Study, consisting of representatives of the Pearl and independent scientific experts. This committee judges whether the proposed study is relevant, methodologically valid, compliant with the scientific aims of the Dutch Parelsnoer Institute-CVA Study Group and with the privacy protection rules. In addition to this scientific committee, the Research Ethical Committee of the coordinating UMC and several other participating centers have to grant permission according to local policy. When the proposal is accepted by all committees, data from the central PSI facilities will be delivered by the PSI data manager to the researcher. Requested biomaterials will be delivered by the biobank coordinators of the UMCs. If the subsequent research project results in new individual data on the biosamples, PSI demands these newly acquired data to be made publicly available for future research purposes. For researchers using PSI data, costs are involved. These costs include direct costs for retrieval of the samples from the UMC biobanks and shipment of the samples. In addition, depending on the defined collaboration with external researchers, consortia or industrial partners additional costs will be negotiated for the Biobank related acquisition costs, sample and data collection, research project costs and contribution to the sustainability of the Parelsnoer Institute CVA-Biobank. Samples from the same donor may be used for multiple projects. The researcher may only receive samples and data on two conditions: i) they share their scientific findings with PSI and provide PSI with a copy of the published paper, and ii) they acknowledge the Dutch Parelsnoer Institute-CVA Study Group in all publications of studies using PSI data and samples. Hendrikus J. A. van Os: drafting of the manuscript. Ynte M. Ruigrok: Chair of the Stroke Pearl management board, critical revision of the manuscript for important intellectual content. Judith Manniën: National PSI Data Manager, critical revision of the manuscript for important intellectual content. Ewoud J. van Dijk: Stroke Pearl manager Radboud UMC. Peter J. Koudstaal: Stroke Pearl manager Erasmus MC. Gert-Jan Luijckx: Stroke Pearl manager UMC Groningen. Paul J. Nederkoorn: Stroke Pearl manager AMC. Robert J. van Oostenbrugge: Stroke Pearl manager Maastricht UMC. Marieke C. Visser: Stroke Pearl manager VUMc. L. Jaap Kappelle: Stroke Pearl manager UMC Utrecht. Hein W. Verspaget: National PSI Biobank coordinator, critical revision of the manuscript for important intellectual content. Ale Algra: Issuance Coordinator, member of the scientific committee of the Dutch Parelsnoer Institute-CVA Study. Marieke J. H. Wermer: Stroke Pearl manager LUMC, supervision of lead author, critical revision of the manuscript for important intellectual content. Manniën, J, Ledderhof, T, Verspaget, HW, et al. 2017. The parelsnoer institute: A national network of standardized clinical biobanks in the netherlands. Open Journal of Bioresources, 4. Aalten, P, Ramakers, IHGB, Biessels, GJ, de Deyn, PP, Koek, HL, OldeRikkert, MGM, et al. 2014. The dutch parelsnoer institute – neurodegenerative diseases; methods, design and baseline results. BMC Neurol., 14. Van Wier, MF, Huizinga, TWJ, Brouwer, E, et al. 2016. The rheumatoid arthritis and arthrosis pearl: The biobank for early arthritis patients of the dutch umcs. Ned Tijdschr Reumatol., 2: 32–39. Vriend, JW, van der Velde, ET and Mulder, BJ. 2004. [national registry and DNA-bank of patients with congenital heart disease: The concor-project]. Ned. Tijdschr. Geneeskd., 148: 1646–1647. Catalogue of the Parelsnoer Institute. 2017. www.parelsnoer.org/page/en/Catalogue (accessed October 5, 2017). Promise (project manager internet service). 2017. https://www.msbi.nl/promise/ (accessed October 5, 2017). Association WM. 2013. Wma declaration of helsinki – ethical principles for medical research involving human subjects. http://www.wma.net/en/10home/index.html (accessed 4 August 2014). Societies FDFoBS. Code of conduct for responsible use of clinical data and biological samples. www.federa.org/sites/default/files/digital_version_first_part_code_of_conduct_in_uk_2011_12092012.pdf (accessed October 27, 2017).